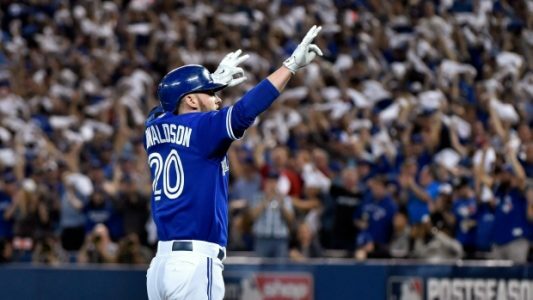 Cleveland Indians vs. Toronto Blue Jays American League Championship Series Free Picks & Predictions October 17, 2016. The Toronto Blue Jays will host the Cleveland Indians in Game 3 of the American League Championship Series Monday night as the series shifts to Rogers Centre. The Indians hold a firm grip of the series after a pair of victories home at Progressive Field and the Blue Jays can’t afford to drop into a deeper hole. Toronto opened as a -185 favorite on the moneyline which is still the line as of the publication of this Indians vs. Blue Jays free pick. Rougly 60 percent of the wagers have come in on the home team without moving the line while the total is holding steady at the opener of nine runs. Good pitching have been the key to Cleveland’s early success in the series. Scorelines of 2-0 and 2-1 suggest tight pitcher duels which certainly have been the case. That might not hold true tonight though with Trevor Bauer on the mound for the Tribe. Bauer (0-0, 5.79 ERA) conceded three runs through four plus innings of a 5-4 victory over Boston in the division series, and he was scheduled to start Game 2 against Toronto before cutting his finger while repairing his drone. The UCLA product enjoyed one of his best starts of the season when he took on Toronto on Aug. 19 as he held the Jays to two runs in eight innings and struck out a career-high 13 hitters. He is 1-1 with a 6.27 ERA in four career games (three starts) against Toronto. The Blue Jays scored a total of 22 runs in a three-game sweep of the Rangers in the division series, but they couldn’t get anything going in Cleveland. Perhaps a return home to Rogers Centre is just what the doctor ordered as they’re 5-1 in their last six playoff home games while Cleveland is 1-4 in its last five American League Championship road games. Marcus Stroman (0-0, 3.00 ERA) will take the hill for Toronto, and he held the Orioles to two runs and four hits over six innings in the American League wild card game. Stroman is 0-0 with a 1.29 ERA in two starts against Cleveland this season with 15 strikeouts in 14 innings. He has posted a 3.52 ERA in three career meetings with the Tribe. Tonight’s contest is a real must win game for the Blue Jays, and they face a pitcher they’ve had decent success against in previous meetings. Lay the lumber on the favorite.